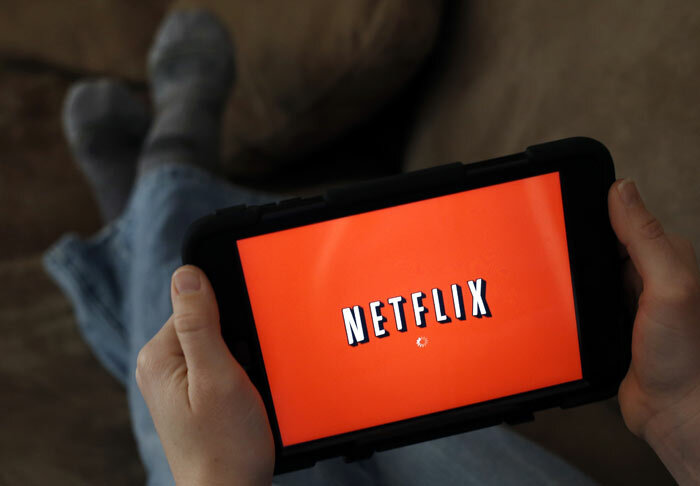 As the Netflix service has matured it has sought to segment the market further. This is a common business tactic to make the most from the customers that are interested in your product. Thus Netflix moved from a sole low price offering (it started with one price plan in the UK in 2012 - £5.99) to currently offering Basic, Standard and Premium memberships. All the current memberships can watch unlimited films and TV shows and any device they like but as you move up through the subscription tiers the highest available viewing resolution increases, as does the number of simultaneous viewing screens (and the price). Now it looks like Netflix is considering a new, even higher tier, subscription level. 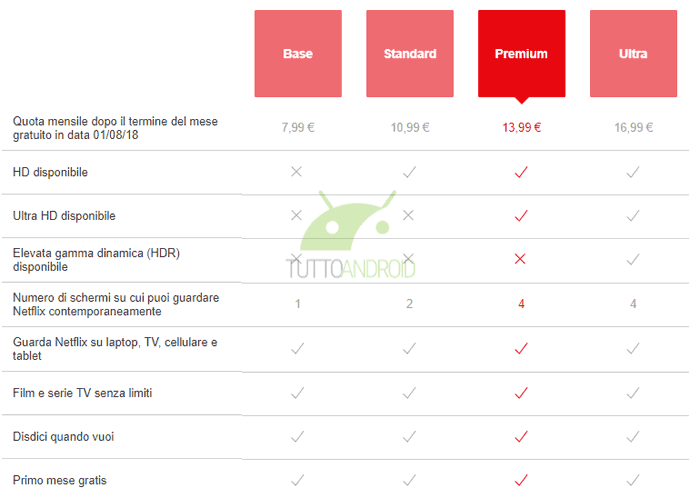 The proposed 'Ultra' membership was captured in a screenshot by an Italian Android blog, Tutto Android. Subsequently CNet has received a statement from Netflix, confirming it is testing the water for this new tier. From looking at the Italian pricing plan screen grab, below, there is quite an obvious issue with the new Ultra level subscription. It appears to take a feature away from the existing Premium level subscription - moving HDR visuals up from Premium to Ultra, and charging 3 Euros extra a month for that sole benefit. In an email to CNet, Netflix said "We continuously test new things at Netflix and these tests typically vary in length of time." Smita Saran, a Netflix spokeswoman, explained in the email that "In this case, we are testing slightly different price points and features to better understand how consumers value Netflix." Another set of 'test' price plans, spotted by the original source, instead limited the Premium account to 2 simultaneous screens while the Ultra members were allowed four - but both levels had access to HDR in this case in this permutation. The current Netflix Premium subscription costs are £9.99 in the UK and €13.99 in Italy. How much would the Ultra membership cost in the UK if it is €16.99 in Italy? Using the same conversion rate works out at £12.15 in the UK - so pricing would be likely to be either £11.99 or £12.99 for Ultra here. Microsoft Edge based on Chromium preview builds arrive Battlefield Currency, based on real money, goes live Apple's video streaming subscription service due in April EU content quotas for Netflix and Amazon to become law Have we reached peak Netflix? I'm a recent convert to the subscription model, I think it offers great benefits, having Dropbox, Spotify, Amazon Prime and Netflix accounts…however there are limit to what I'm willing to pay. For me there's a mental ceiling of £10 per month per service. I'm potentially open to paying more if I think the service is worth it, but right now I would seriously reconsider any service trying to charge more than that. Hmm, I'm currently on the Premium setup as we kept getting errors that three of us were watching at the same time. If they take away HDR, we don't really have the kit to notice so nothing changes. If they took away 4 channels at once, then I downgrade to standard. I can't see any parallel universe where I would upgrade to Ultra, the service is good but not worth that much to me. Netflix has bigger issues. Firing someone for saying an offensive word during a meeting about offensive words was madness. Streaming a film with child pr0n in it ultimately showed me they really do have no morals whatsoever. They can keep their HDR and their service. And as usual there's no ‘in between’ option for someone like me who would need just one stream and would eventually want 4k and hdr etc…. while I'm all for getting the ‘best value’ I also have an issue for paying for stuff I'll never use. EDIT: and side note, increasing prices is not the way to ‘discourage’ people from getting things from ‘alternative’ sources…. Probably the final nail in the coffin for Netflix for me. Already on the top package and to have HDR removed just so that they can charge extra for it, when the catalog keeps getting smaller and many classics that you look for are not there any more, is just too much for me. Great way to force people to Showbox, Terranium etc!